The Grand InterContinental Seoul's Grand Café (1F) will be featuring a "Sushi & Roll Buffet" on Friday and Saturday evenings from 6:00 pm to 9:30 pm until the end of April. 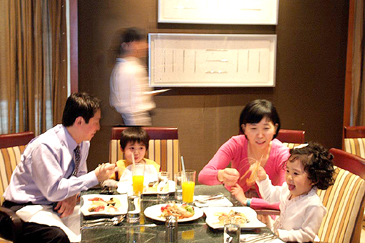 This buffet is specially designed to encourage families to enjoy a weekend dinner together. A wide selection of sushi, roll and Makis are prepared by one of the hotel's great chefs. With our "Sushi & Roll Buffet" you can enjoy a myriad of seafood delicacies such as tiger prawn, salmon, Alaskan king crab and green mussels. Don't miss our shark's fin soup, abalone porridge, seafood so-myun, tempura u-dong, seafood and vegetable tempura and mero fish with garlic butter. How about Japanese-style specialties such as teriyaki eel fish, sea cucumber, okonomiyaki and five different kinds of dim sum? At our dessert section, we are offering fresh fruit with cheesecake, pecan pie, mango mousse cake and sweet tiramisu cheese.